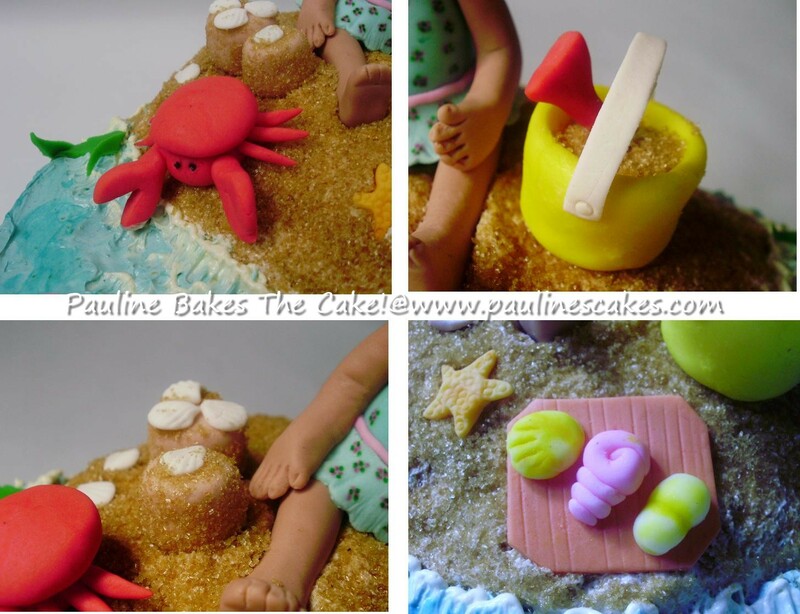 I was commissioned by a client to design an underwater themed cake with a personalized cake topper for her daughter Thanya's 1st birthday. Mom wanted an underwater theme since her daughter loves her fishes and her bedroom is decorated with them. 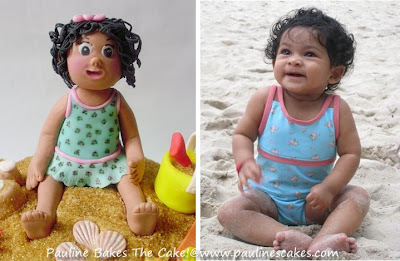 She also requested for a figurine of a "curly haired little girl in a swimsuit", modeled after her daughter, sitting on the cake. Based on this, I made this beach and under the sea themed cake especially for sweet and cute Thanya. 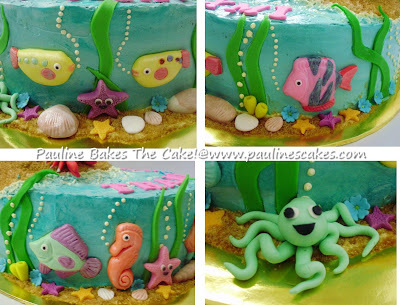 Cake flavor is rich butter cake layered, filled and covered with Mousseline buttercream (also known as Italian Meringue buttercream), a less sweet alternative to buttercream icing and fondant icing; and decorated with fondant accents and decorations. Mom sent me this photo of her sweet Thanya, taken a few months ago, for my reference. 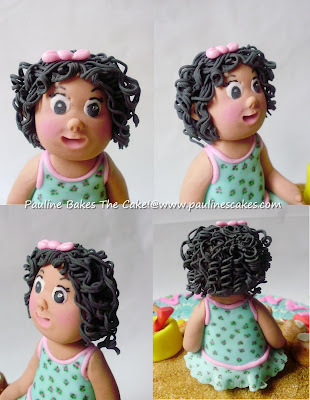 The cake topper : "Curly haired little girl in a swimsuit" sugar art figurine. Notice her innocent and "in awe" expression? Made the waves rising up the beach using the brush embroidery technique. Mom made my day! She called me right before the cake cutting to tell me "Thank you! The cake is so beautiful ...way beyond our expectations! We have a problem now because we don't know how to cut into the cake". Happy Birthday Thanya! 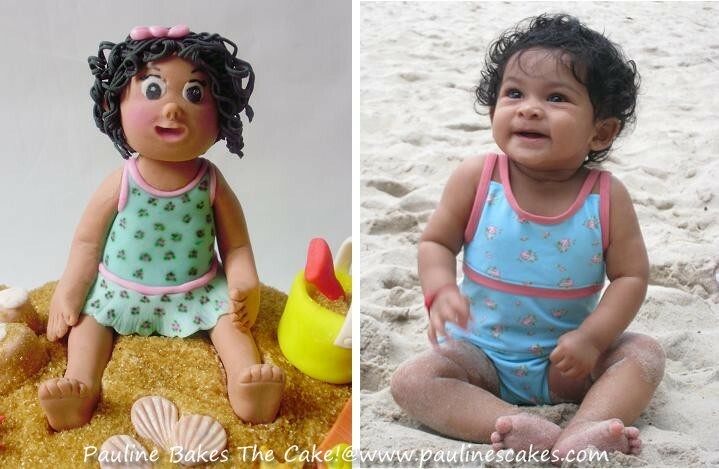 Thanks for the order, Subu (Grandma) and Kanjna (Mom). You my, friend, are very talented! I love your attention to detail! Love, love, love your work! This is a fabulous cake!